Many people don’t fully understand how exactly sugar consumption results in tooth decay, and they also don’t even realize how much sugar they’re actually consuming. At Smile Town North Delta, we believe that moderation is one of the most important tricks to maintaining a healthy diet. And a healthy diet is an important element of overall health, and dental health too. 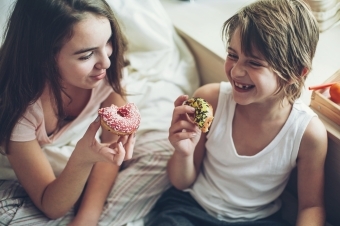 While we make it a point to educate our patients and their parents about the problems sugar can cause when it comes to oral health and cavities, we realize that for most families, cutting sugar our completely it isn’t realistic (or even healthy). For most of us, sugar is a necessary (and enjoyable!) part of daily eating habits. So rather than demanding our patients cut sugar out of their diets completely, we suggest that they take the more reasonable and therefore likely more effective approach to their sugar consumption, and simply keep it moderate. The problem remains, however, that many people aren't aware of the amount of sugar there really is in the food they eat every day, leading many people to overindulge in sugars without even realizing it. We all know that sugar causes cavities. But there's more to the story! The bacteria that live in the mouth feed off of sugar, producing acids. These acids are actually what cause cavities, because they eat away at the enamel and dentin of our teeth. Put simply, sugar + bacteria = acid… and acid causes cavities! We all know to avoid or cut back on certain things when it comes to to dietary sugar: cake, candy, gum and other sweet treats, for instance. But sugar seems to be an ingredient in almost everything else these days as well! During your next trip to the grocery store, take some time to read the ingredient lists of some of the packaged foods you're thinking of purchasing. You’ll quickly realize that they're putting sugar in everything from bread and dairy products, to packaged dinners and canned tomato sauce. But don't worry. Now that you're more aware, you can take steps to avoid unnecessary dietary sugar, and save your kids’ sugar consumption for when it's time for a treat! Take time to read ingredients lists while you’re shopping. This takes only a little extra time and will allow you to familiarize yourself with which products and brands contain sugar, and how much. In some cases, all you'll need to do is switch out a few brands to cut down your family’s sugar consumption significantly. There’s more than one way to say ‘sugar’! There are many words that appear on ingredients lists that indicate sugar, and some brands try to disguise the large amounts of sugar in their products by naming all the different types they use separately in the list. There are many other words in addition to these, too. So learn some of these terms before your next trip to the store, and don’t be fooled! Processed foods are very convenient, but there is a price to pay for that convenience. Processed foods often high in sugar (even surprising ones, like the canned tomato sauce mentioned above), so whenever you can, try to cook your own food from scratch. Cooking from scratch is easily one of the best ways to avoid unwanted dietary sugar, because if you're the cook, you’ll know exactly what ingredients and how much of each you’ve added to the dish. Contact Smile Town North Delta today for more tips and advice on avoiding dietary sugar.